When this Française first made its debut on the internet it received nothing but rave reviews on every forum. You’re a tough crowd though. Some of you gave it top marks for its uniqueness, but quite a few of you were not wowed. You found it too costume-y, cartoon-y, clumsy, and Christmas-y (kaftan-y was a good thing though!). A polarising pick, with a meh result. Will this week do better? Last week’s dress featured cypress. Cypress trees are an important symbol in Zoroastrianism, and often feature in the Zoroastrian art. They appear in Indian art after the Zoroastrian exodus to India after the rise of Islam in the Middle East, and are probably one of the motifs that led to the development of the boteh or paisley design. So it’s fitting (at least according to the logic of my brain) that this week’s Rate the Dress should feature paisley. This ca. 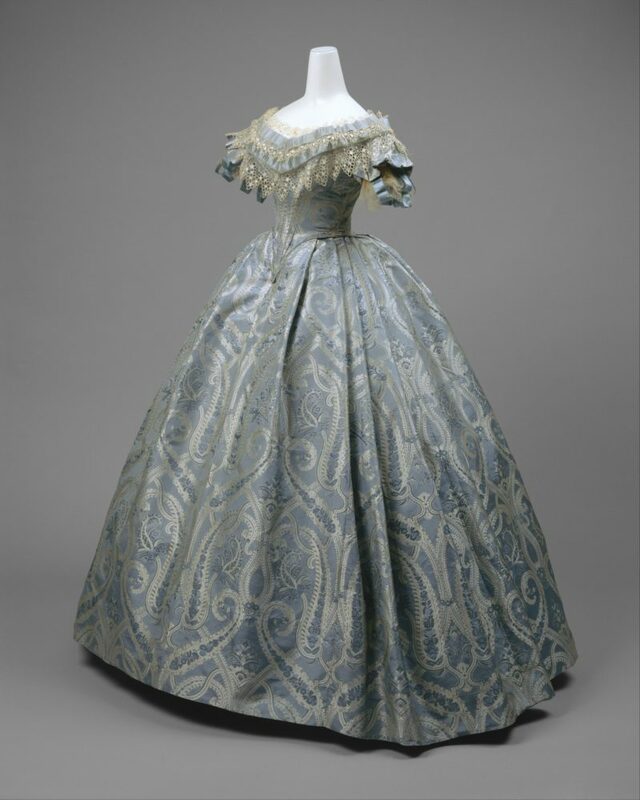 1860 dress is made from a spectacular paisley-themed jacquared-woven brocaded silk. 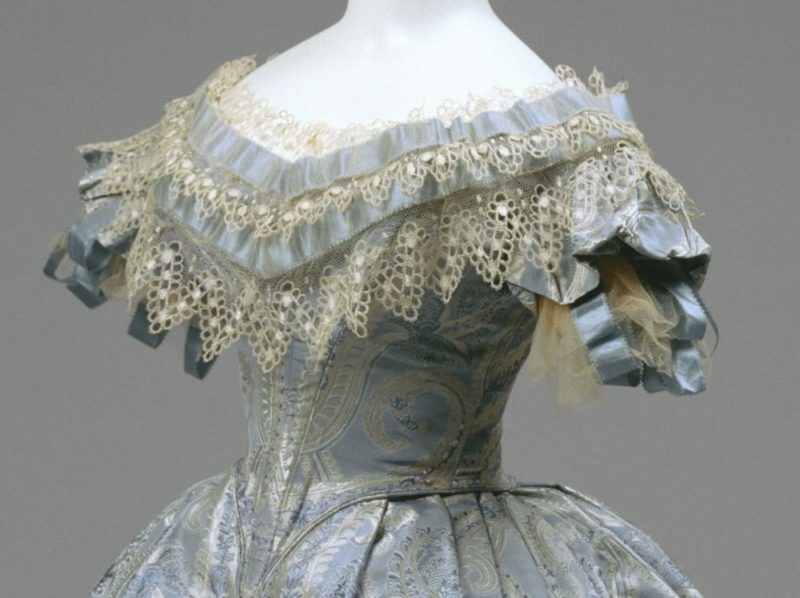 While the scale, shape, and arrangement of the paisley motifs are typical of the 1850s & 60s, the colour is so unusual in combination with the design that I would have assumed this dress was a film costume, if not for its excellent provenance, and impeccably period details in every other respect. Most early-mid Victorian paisleys come in a combination of warm hues, with frequent uses of red and orange. Beyond the archetypical kashmiri shawl, boteh designs were usually seen on informal wrappers for men and women, or, in white-on-white, in undergarments. 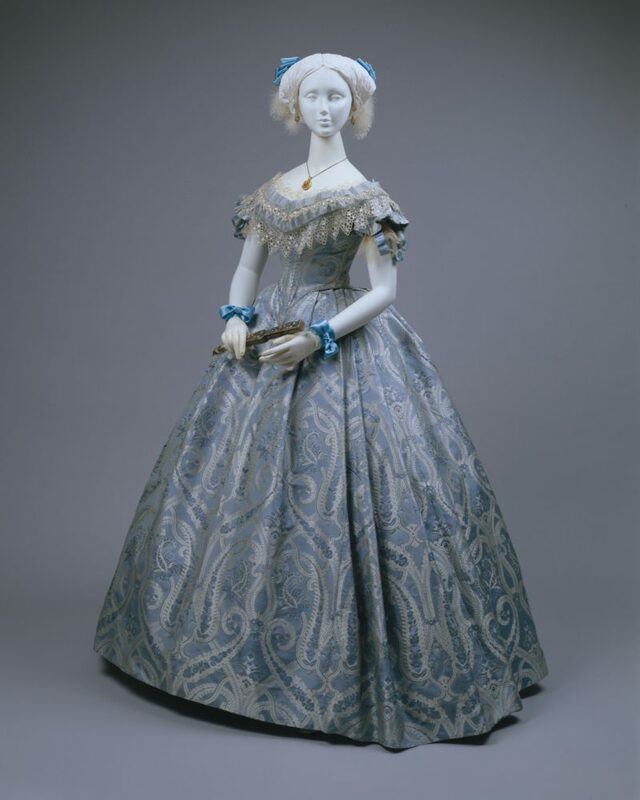 There are a few other gowns that feature simple appliquéd paisley motifs, but this fabric, with its silvery blues, is almost as unique for its timeperiod as last week’s cypress. 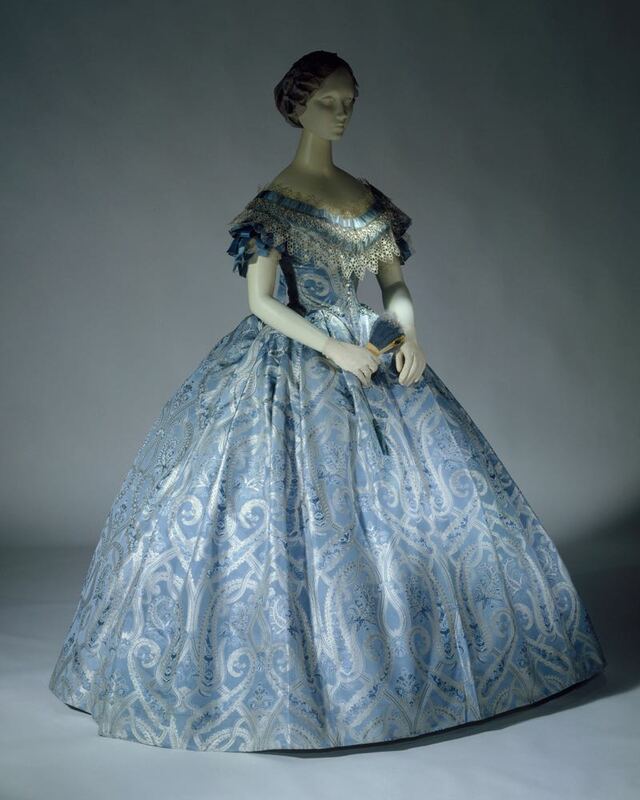 Other than the striking paisley fabric, the ballgown is quite typical of high-end mid century construction. 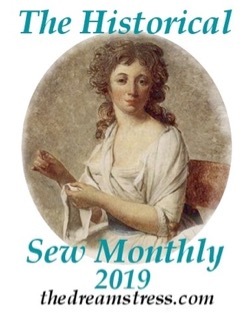 It features a frothy berthe, delicate sleeves made of puffs of tulle and loops of picot-edged ribbon, and a sharply pointed bodice, finished with a double row of piping. 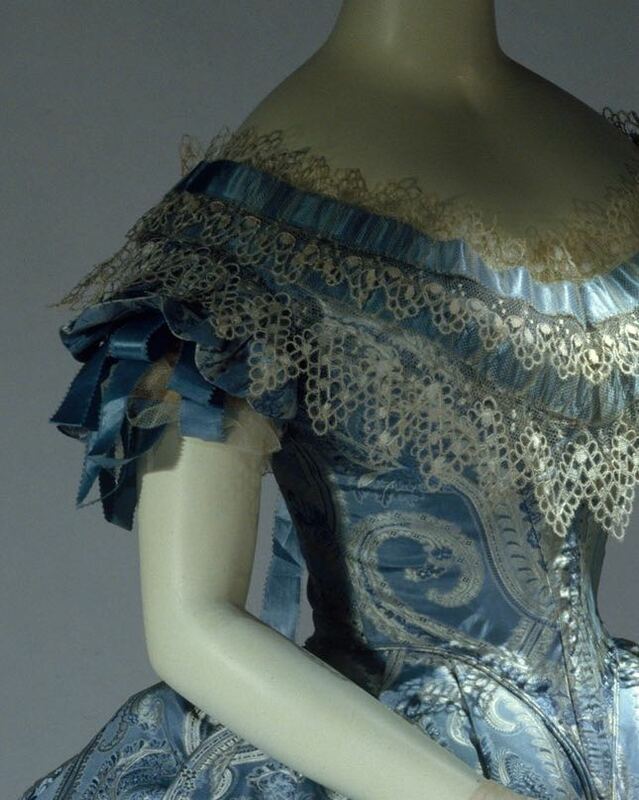 The photographs that the Metropolitan Museum of Art provides sadly do not include a back view, but they do show the dress in a range of colours. I think of an array like this of showing the range of true colours a garment can have, depending on the lighting it was seen with. I certainly have clothes that look very different by day (and even time of day), candlelight, and different artificial lights. Amoebas! Silvery-blue amoeba goodness! For a long time I didn’t like paisleys, but now I appreciate them, even if I do call it amoebas. 🙂 I love love love the fabric and the skirt. The berthe, sleeves, frothiness, and very-pointy bodice, not very much. But, not my dress, they were the fashion, and well- but not over-done. I can’t see a fault. *Sigh* It’s the perfect Cinderella dress. Eye-candy from tip-to-toe. The paisley is luscious. I love it. Really love it. I want to have the dress and a reason to wear it. It’s perfect. It is a fairy tale. The mannequin and lighting in the first image seems to wash out the delicate, looking glass color scheme. But the other images shows the range of possibilities this dress holds. It would look great with more saturated, darker blues. It could pair with grays, whites. 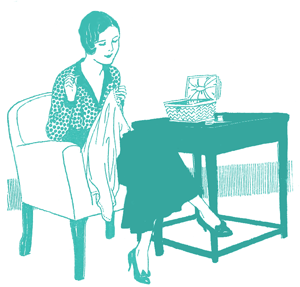 I’d love to see it with a gray lambs wool shawl. Although not pictured, I’d like to experiment with burnt orange and even dark brown accessories, too. If it is inviting you to play with it, I think it is a mark of good design. I love the berthe; the heavy lace and ribbons give it just the right amount of attitude. I was less sure about the fabric of the dress. I’m not usually a fan of paisley, but the color scheme, coupled with how well the scale of the motifs displays across the skirt, won me over. Even so, I would not want to wear this gown–the motif would make me look even smaller than I am, and not in a good way. But the gown is a true work of art and would look well on many other women. Stunning! Gorgeous! I love paisley! This fabric is absolutely luscious. This gown visually expresses that less (decoration) is truly more with the right fabric. I love it. That is a lovely dress. The kind of dress I would have loved to wear, were I 3 dozen years younger and still had something like a waist and, of course, somewhere to wear it. The color, the trim, the execution…all work together so nicely. 10/10. Oh it’s perfect! Very 1860s Cinderella. I love it. Love it. Understated design/trimming, paired with very elaborate fabric. Well, this is just what the fairy godmother ordered. I like this much better than the over the top blue ballgown they put Lily James in in the 2015 Cinderella. And a glance at the comments shows I’m not the only one who got a Cinderella/fairy tale vibe. It’s incredibly lovely. It feels a bit boring, but that may be because I’ve seen modern prom gowns and the like that have a similar look. As you say, in its day it would have been much more startling and innovative. So I’m going to look at it that way. I’m usually not a fan of froths of lace, but it feels very fitting here, and I really like the angular shape of the lace itself. 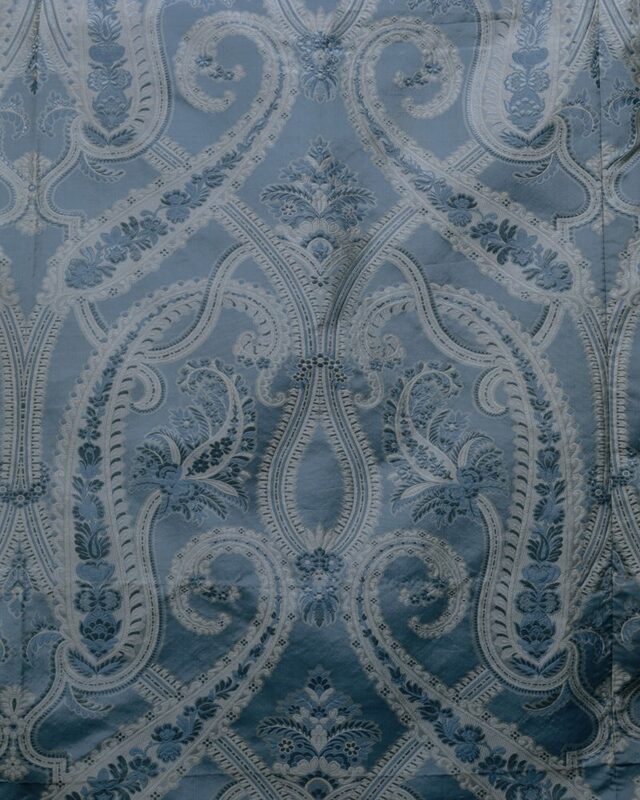 10/10 because… paisley! And truly, nothing to detract from that – the making and fripperies only serve to enhance. Perfectly lovely. Simply stunning. There is nothing I dislike in this dress. Each of the views is beautiful. I love this dress and want to own it, wear it, or at least, recreate it. It really is unusual and yet typical and quite lovely! 10/10. Blue’s not my color but I love this! Perfect! I have a weakness for Cinderella ballgowns, and this one certainly falls into that category! This might be the prettiest bertha I’ve ever seen and the patterned fabric keeps the large plain 60s skirt from being boring. I do hate the blue ribbons they’ve styled the dress with in the first couple photos, but that certainly isn’t the dress’s fault. 10/10 for that fabric alone! It’s so beautiful! Lovely! Such an angelic color! Someone had a generous clothing budget. The design is perfect for the era. I adore the colors, and the choice of Paisley shows originality. Such perfect construction too. gorgeous! Love it! gets a 9 cos there’s other dresses I love even more. Beautiful shades of blue, and delightfully understated, letting the fabric show itself off. 9/10. This dress is perfect. The lace, the shape, the fabric. … no way to make it better. 10. Beautiful! It has a Renaissance feel while being completely in an 1860s style. The paisley gives the skirt a fluid look but also reminds me of Damascus steel or ice. It would probably look like water in motion. The person who constructed it took care when picking which section of the fabric to use for the bodice. 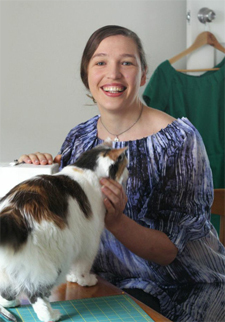 The bertha is perfect for the material and doesn’t overwhelm the dress, which it would do with a plainer fabric. The ribbons on the sleeves continue the soft/hard theme. I normally look at these and ask myself what I would do to improve the dress. On this one I wouldn’t change a thing. I’m in love. The patterning on the skirt shimmers, looks like a whole. The color reminds me of Cinderella (in the best possible way). The side pleating adds grace to the wide skirt. The lace on the bodice is wonderful. I feel like this is what Cinderella would wear, if the story was set in the 1860s. So pretty! The complexity of the paisley and bertha lace (which is some of the loveliest I’ve ever seen) are restrained by the simplicity of the color scheme. Aha! Spamhaus must be sorted again. It’s a lovely delicate dress with everything in scale. This almost looks like the inspiration for Cinderella’s dress in the live action Disney movie. It’s just so pretty! 10/10. I WILL BE GOOD ENOUGH TO SEW A BALLGOWN LIKE THIS. That is a promise. First of all, the fabric is lovely! 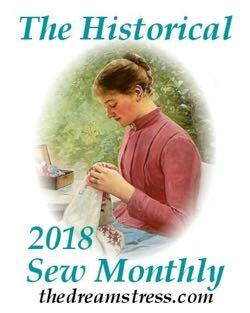 While the overall dress design is indeed typical for its time, nevertheless I find it very appealing(and I don’t always like 1850s-early 1860s very much). With the rich fabric, I think it was a good choice to keep the dress design fairly simple; this allows the fabric to shine and keeps the dress from looking overdone. 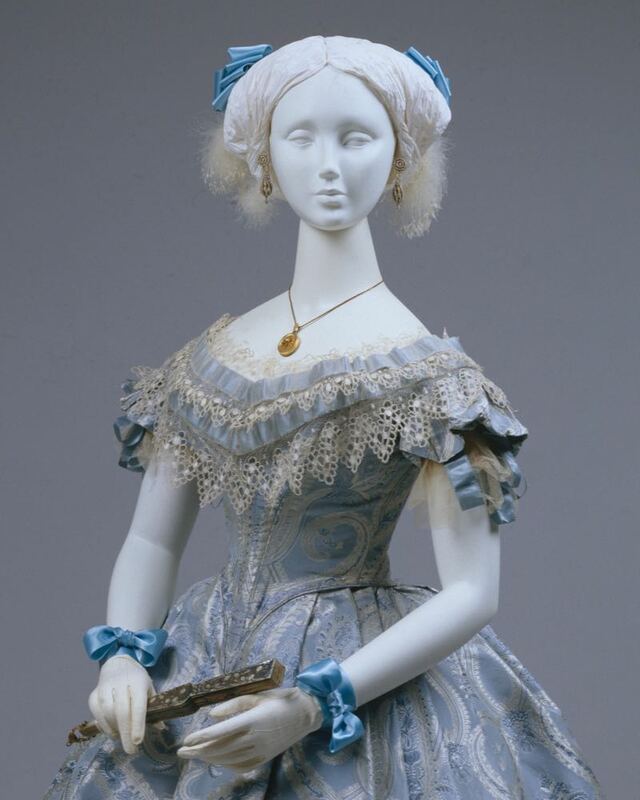 The pale blue color gives a delicate feminine Cinderella-ish feel without being twee. I love the frothy blonde lace on the bertha! Looking at the first picture for a second I thought it might be broderie anglaise, but it’s definitely blonde lace. The other pictures make that clear. That makes sense since blonde was very much in vogue mid-century, and IME broderie anglaise wasn’t really used on evening gowns. Oh and I also find the little tulle sleeve poofs with ribbon trimming very charming. It’s an idea I would consider stealing if I make a Victorian evening dress. I wonder if it could be adapted for the natural form era. I’m going to give this a 9 because it’s really lovely, but just a little too conventional to warrant a 10. There’s nothing wrong with being conventional of course, it’s just that I want to reserve perfect scores for garments that are a little more inventive, that are willing to take risks if you know what I mean. While there’s nothing about this dress that I dislike, it kind of plays it safe. The fabric is absolutely to die for. I love the silhouette and how the pleats on the side make the skirt fall. The lace pairs perfectly with the look of the rest of the garment. The museum’s object ID says ‘a-c’, I wonder what the third piece to this garment is, along with the bodice and skirt. Maybe the fan or a ribbon? I love the paisley fabric, and it’s a beautiful dress! The only thing I dislike about it is the ribbons on the sleeves, they seem out of place. That, and the wrist ribbons paired with it in the first picture aren’t so great. absolutely wonderful. The brocades skirts remind me a bit of 18th-century saque gowns, although the pattern is different. Normally I don’t really care for 1860s, but here the lace and delicate nature of the berthe go perfect with the fabric.